Nutribullet 8pc Just $59.95! Down From $135! PLUS FREE Shipping! 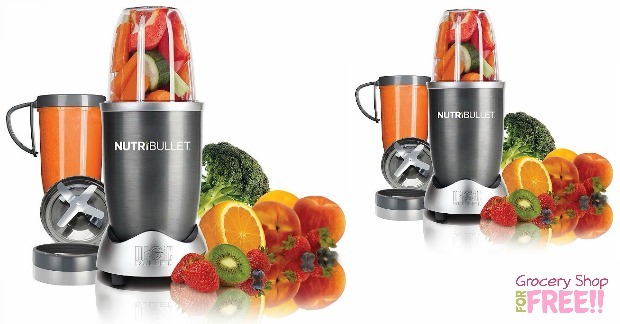 You are here: Home / Great Deals / Nutribullet 8pc Just $59.95! Down From $135! PLUS FREE Shipping! You can get this Nutribullet® 8-pc. Nutrition Food Extraction System is just $59.95 right now! It is originally $135! I love this! We have one and we use it for everything from making soups and smoothies to making whipped cream! It is super easy to use and to clean! There may be many blenders and juicers on the market, but there is only one NutriBullet. The original and bestselling 600-Watt NutriBullet transforms ordinary food into superfood, extracting fruits and vegetables into powerfully healthy NutriBlast smoothies. Simple to use and easy to clean, the Original NutriBullet is the perfect tool for those taking their first steps towards a healthier lifestyle. Its compact size and simple assembly fit onto any countertop, while its powerful motor and blades allow you to extract fruits, vegetables, nuts and seeds with minimal chopping, peeling, or prepping. When getting more produce into your diet is this easy, extraordinary nutrition becomes a convenient part of your everyday routine. The Power Base is the heart of the NutriBullet. Simply plug in the NutriBullet, place the Tall Cup onto the powerful 600 WATT, High-Torque Power Base and press down. Combined with the NutriBullet’s exclusive Cyclonic Action, the Extractor Blade generates the power to break through tough seeds, thick stems and tough skin to access the hidden nutrition inside your favorite produce. The blade is made of stainless steel and never needs sharpening. The classic 24-oz NutriBullet Tall Cup provides the perfect amount of space to extract all of the goodness inside your daily NutriBlast. Twist on the Comfort Lip Ring for an easier drinking experience. This 18-oz Short Cup is perfect for concocting smaller NutriBlast portions. Twist on the Handheld Comfort Lip Ring for easier transport and sipping. This guide contains essential product information as well as delicious and nutritious life boosting recipes to fuel your lifelong health journey.